The villa is situated in a quiet, residential area with only villas at the end of a dead end road, approx. 150 meters from the Mediterranean and approx. 90 meters above the sea. Has a 46 m2 (8,04 x 5,69 m) swimming-pool constructed in 2017. 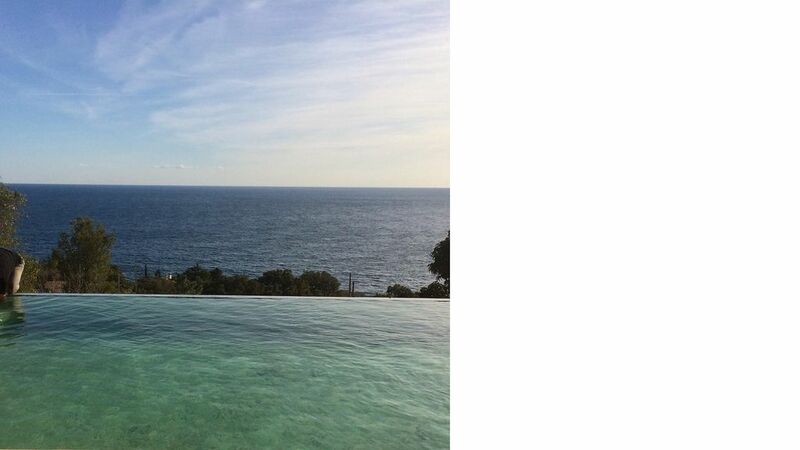 The view from especially this villa is among the most beautiful along the whole Cote d'Azur-coast, with a quite extraordinary direct, free view over the sea (220 o), among other things over to Saint Tropez against west and against Cannes in east. The built-on area of the villa is approx. 250 m2 on 2 floors (entrance on the 1st floor) and including very large terraces to the south (in 3 levels - potential possibility for the sun: from morning to dawn), carport (space for 2 cars) etc. is the total built-on area of the villa approx. 425 m2 on a 2,030 m2, partly landscape garden site, which slopes, steep downwards towards the sea. wants to rent it together. Linen plus 2 towels/person can be rented for EUR 20/person. Parking on the ground as well as on the street is possible. The total Ground is 2.030 m2. The villa is equipped with all sorts of modern kitchen equipment, kitchen hardware (dishwasher, washing machine, refrigerator, gas cooker, oven & microwaveoven etc. ), furniture (indoor as well as outdoor), colour-TV, satellite dish (Astra), transistor radio, fireplace/open barbecue/grill (Weber). The villa is now equipped with a swimming pool, but is as well situated near several beaches (sandy beaches as well as beaches with small stones; distance to the nearest 200 meter), windsurfing possibilities, tennis courts, 3 golf courses and several sightseeing opportunities, among others just nearby the biggest, residential area (Esterel massif - the 'red cliffs') on the Cote d'Azur-coast situated on the major part of the distance between Cannes and Antheor. Several restaurants and good shopping opportunities in the local area, and also near a big and modern shopping centre (eg. see the enclosed Clarity sheet).